Service with a smile. Freshly fried tod man pla or fish cakes. 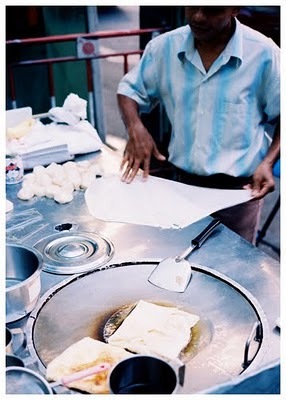 The fish paste is made on-site daily (maybe even a few times a day), infused with fresh herbs and shaped into patties. These are then served with a sweet cucumber relish. The shorter sausages at the rear are called sai krog isaan, a slightly fermented pork and rice sausage popular in Northeast Thailand. 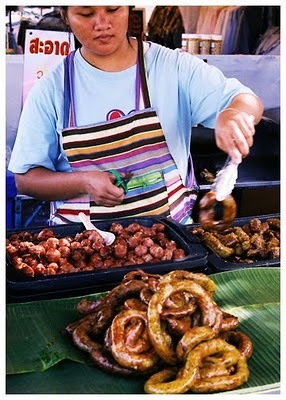 The longer sausages are called sai ua; also made of pork and usually loaded with chilies, coriander, garlic, kaffir lime leaves and other aromatics. These are all grilled on coals and are fabulous eaten with som tam (papaya salad) and sticky rice. Roti‘s also available on the streets. Super thin elastic dough whipped and stretched then fried in oil. Only its not served with the usual curry or gravy on the side. These are filled with either shredded chicken (roti gai) and a freshly cracked egg and served with a vegetable chutney on the side; or sliced bananas and an egg (roti gluai) then drizzled over the top with condensed milk. I favor the latter with the slightly crisp, slightly chewy roti on the outside with the rich, gooey bananas and soft cooked eggs on the inside. 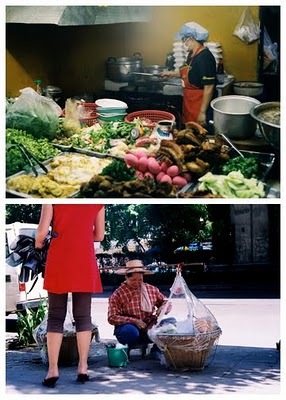 Every block in Bangkok probably has its own cooked food market. Large covered structures with independent stalls offering their own specialties. 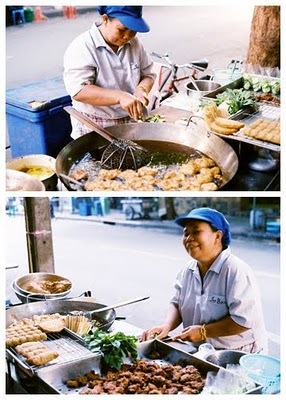 Depicted on the top frame is a typical vendor’s setup; cooking food to order. And below is an ambulant vendor selling, if I remember correctly, something like laarb or ground meat salad with herbs and toasted rice powder. Food is within reach anywhere. 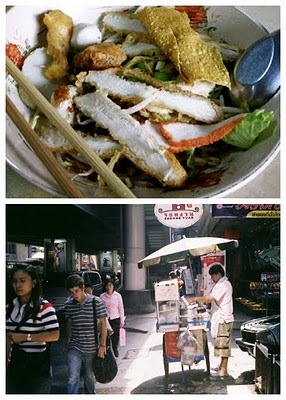 Thailand has a lot of varieties of noodle dishes. From the ubiquitous pad thai to gwaeytiao ruea (boat noodles) to pad see ew (noodles fried in soy sauce), my favorite seems to be one of the most basic ones called ba mee haeng or literally “egg noodles, dry”. There are as many versions of this as the number of people who make it but my favorite “aunt” who runs this shophouse not far from my old apartment satisfies the most. She makes this by blanching some springy egg noodles, bean sprouts and a handful of greens in some broth, drains them and tops with fishballs, sliced meats, you tiao and fried wonton skins then drizzles some lard on the top. I then fine tune this with some nam plaa (fish sauce), chili flakes, sugar and vinegar on the table. To this very day, whenever I’m in Bangkok, which I try to do every year, I swing by for this particular bowl. Fruits are big in Thailand. Big and sweet. The mangoes I love, especially eaten with sweetened sticky rice cooked in coconut milk and then topped with salty crispy beans. Thai variety mangoes have this flavor and texture profile similar to what we locally refer to as “Indian” mangoes, but like three times the size. Farangs or guavas are as huge as softballs. 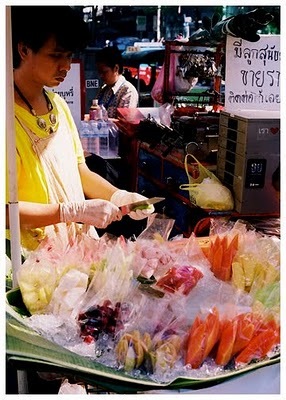 I miss eating the slightly pickled variety called farang dong sold along with other fresh fruit on ice, typically carted along everywhere in the metropolis. What’s interesting to point out is that most vendors are one dish ventures; cooking only one type of food day in and day out, with perfected recipes and an insistence of using only fresh ingredients. It really is quick service with fine dining kitchen mentality. And with most street treats being in the Bht20 to 50 range, its exactly the type of fast food I wouldn’t mind eating every day. Who can be contacted among the contributors of this blog for a magazine feature?